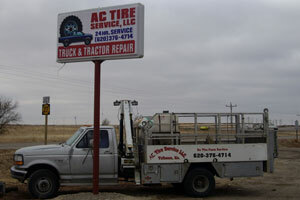 AC Tire is located on the south end of Tribune on Highway 96 and is owned by Adam and Camilla Tarango. This tire and repair shop specializes in tractor and large truck tire repair, tire sales, and vehicle maintenance. They also provide 24-hour tire service and repair, and on-farm services. April 19 & 20, at 7 p.m. & Apr. 21 at 4 p.m.
April 26 & 27, at 7 p.m. & Apr. 28 at 4 p.m.